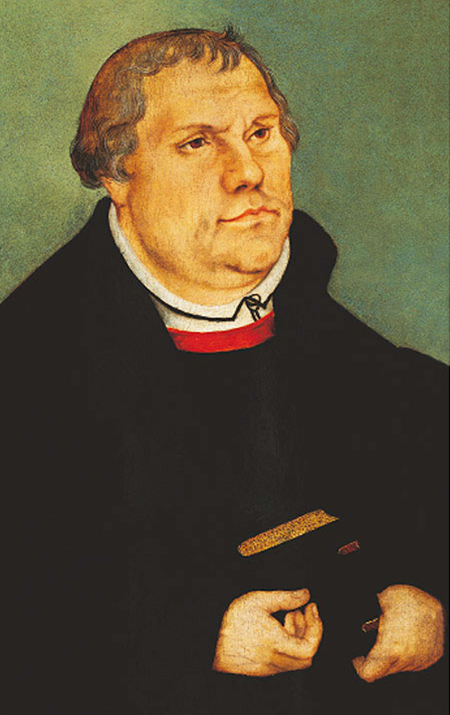 Martin Luther the "pugnacious theology professor"
Martin Luther (1483-1546) had no idea that he initiated the Protestant Reformation when he put in a letter to the Archbishop of Mainz and Magdeburg his 95 theses against the sale of indulgences on October 31, 1517. Martin Luther never intended for them to be so widely published as they were printed and distributed without his permission. 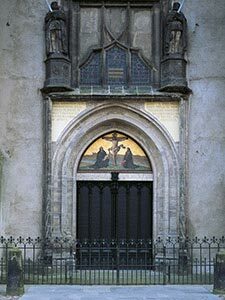 The 95 theses are today visible to everyone on the door of the Castle Church in Lutherstadt Wittenberg. It has been taught in schools for centuries that the written theses were nailed to the doors of the church, and since a discovery of a note in 2006 it would seem that this legend is considered very likely. Although Luther did not object to indulgences as an instrument of forgiveness from punishment for the sin in question, he vigorously rejected the trade in indulgences. He felt that it was not with money that this could be obtain, instead only with good deeds, prayer and pilgrimages. 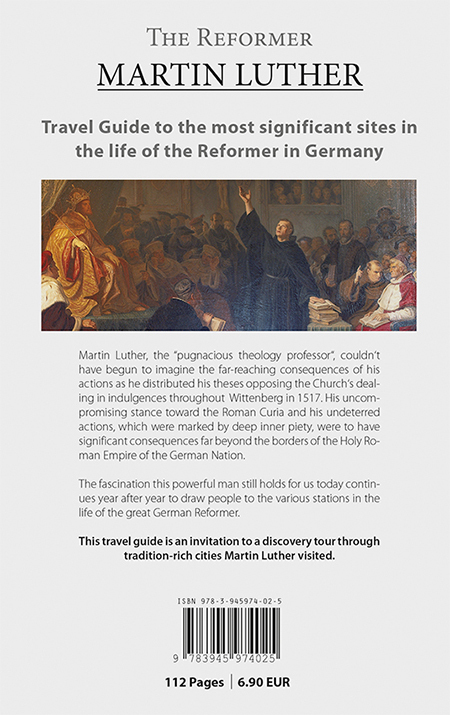 Many people want to travel to Germany today for personal worship and to see for themselves the places that shaped the life of the reformer Martin Luther. 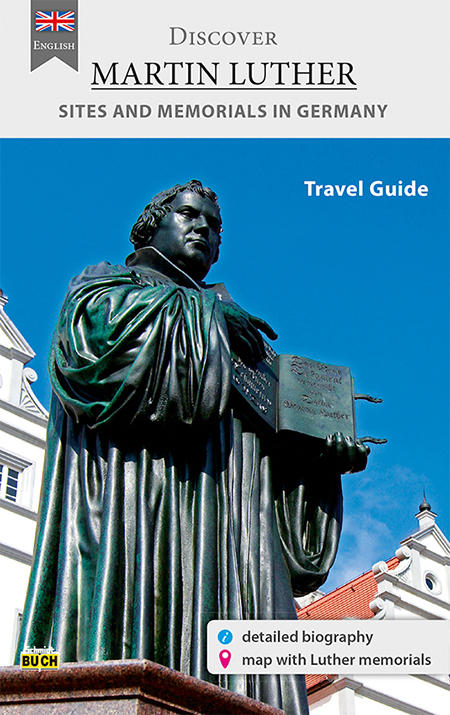 The Luther travel guide (Schmidt-Buch-Verlag, ISBN 978-3-936185-71-3: 6.00 euro) is an excellent publication that gives a comprehensive guide to the most significant sites of the Reformation. Discover Lutherstadt Eisleben, Torgau, Eisenach (Wartburg), Erfurt, Mansfeld Lutherstadt, Worms, Augsburg and of course Lutherstadt Wittenberg. A detailed biography introduces Martin Luther as well as looking at the most important companions and adversaries of the reformer. In 2017 Martin Luther's theses against the sale of indulgences will celebrate its 500th anniversary. In order to prepare and commemorated this landmark event both the state and church declared the celebration of the Luther Decade, leading up to "Luther2017." Under this organizational umbrella since 31 October 2008, countless people have been engaged in many exciting projects with yearly themes. In 2015 the theme is "Reformation - Art and the Bible." 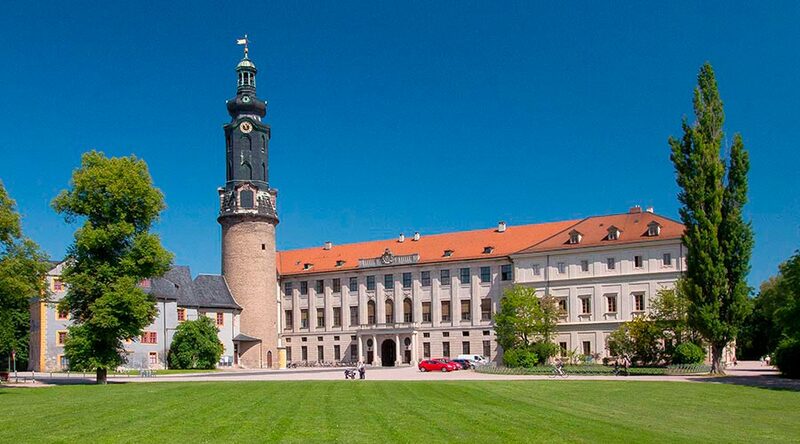 Also celebrated is the 500th anniversary of the birth of Lucas Cranach the Younger with a major national exhibition in Lutherstadt Wittenberg, Wörlitz and Dessau. Martin Luther was born on the 10th November 1483 in Eisleben, and baptized the next day at St. Peter and Paul Church. 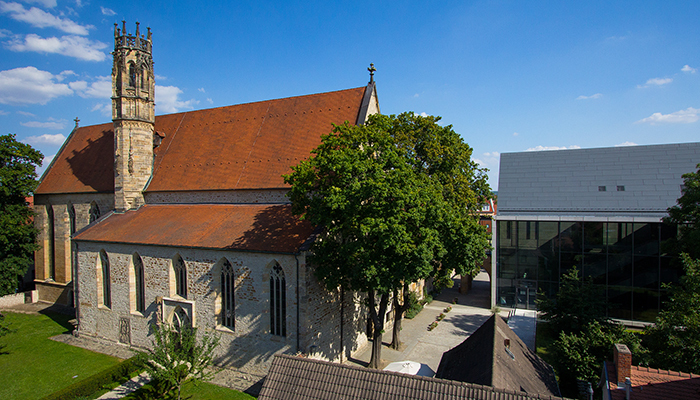 After extensive renovation this Gothic church now serves Lutherstadt Eisleben as a Taufkirche, "baptism church." 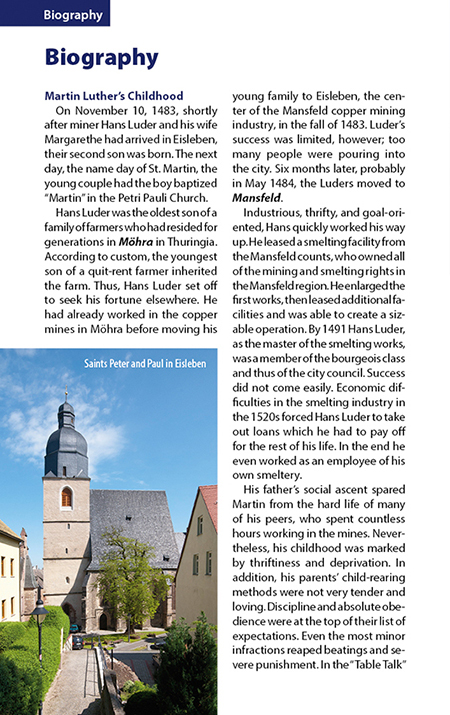 Martin Luther began his studies at the age of four in Mansfeld then in Magdeburg and later in Eisenach before he enrolled in 1501 at the esteemed University of Erfurt for the study of the "the seven liberal arts." 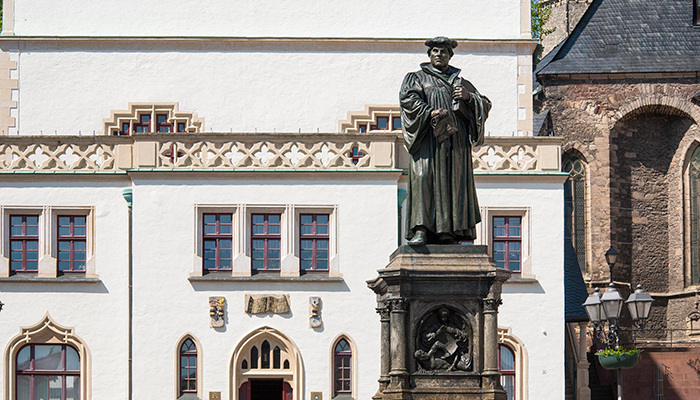 Four years later, Martin Luther began his legal studies in Erfurt. In the summer of 1505 while returning home from visiting his parents he was almost struck by lightning during a sudden severe storm by the village of Stotternheim (close to Erfurt). In mortal fear of death he vowed "I will become a monk!" and on July 17, he undertook this decision as he disappeared behind the gates of the Augustinian Monastery in Erfurt. In April 1507 he was ordained a priest at Erfurt Cathedral and began studying theology. Martin Luther dedicated himself in those first years of schooling with great physical hardness, including fasting, long hours of prayer and ascetic practices. He also spent time studying Latin at the Latin School in Eisenach. This enabled him as student Erfurt monk, to see the numerous abuses in church and society, and gradually to rebel against them. Here he heard and he internalized the records of an old scholar for the first time: "there must be a change, and that is great. As it is, it cannot be!" Doubts about the existing order increased dramatically during a trip to Rome 1511. Martin Luther was sent to Rome by the Augustinian Monastery, where he took despair at the lifestyle of frivolity, luxury and decadence of the clergy in Holy Rome. 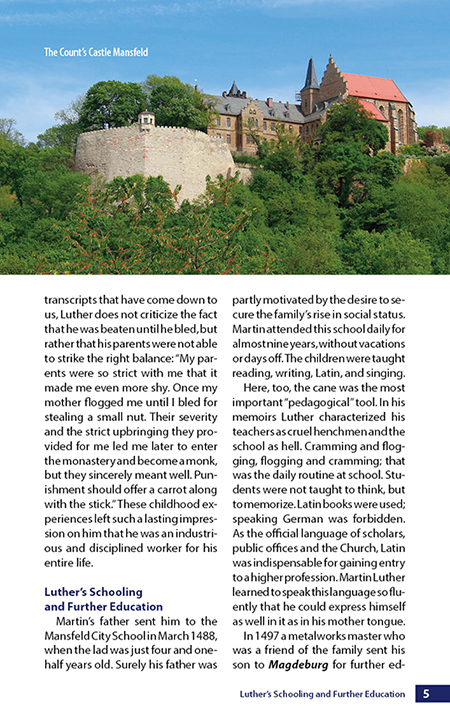 In the summer of 1511, Martin Luther caught up with his own studies. He received his doctorate of theology at Wittenberg at the cost of the Elector of Saxony, Frederick the Wise; who also later held his protective hand over the "reformer-outlaw". From 1514 Martin Luther preached at the parish church in Wittenberg. He was often confronted here with the burgeoning trade in indulgences by the monk Johann Tetzel, which completely disagreed with Luther's conception of the Christian faith. Punishment of sin could not be lifted so Luther thought with money, but with faith. So it came in the memorable year of 1517 to the legendary 95 theses against the sale of indulgences, which Martin Luther wrote on paper and brought to the people of Wittenberg. With the Decade of "Luther2017" countless people from all over the world remember and celebrate that date as the beginning of the Reformation. The violent reaction was not long in coming: Rome demanded delivery of the heretic, which was rejected by the Elector Friedrich the Wise. Instead in 1518 the influential papal legate Cardinal Cajetan failed in his challenge of Luther in a â€œfatherly interrogationâ€� to recant his theses in Augsburg, where the Imperial Diet was held. Two years later Rome sent a papal bull (sealed letter) threatening to excommunicate Martin Luther if he did not recant the 95 theses. This did little to impress Luther who publicly burnt the letter in Wittenberg in December 1520, together with the Roman Catholic Canon Law! As a consequence, Luther was excommunicated by Pope Leo X on 3 January 1521. Because at that time a German lawsuit could only be discharged in a German court (i.e. not in Rome) Martin Luther was ordered by Charles V, Holy Roman Emperor to appear before the Diet of worms on 18 April 1521, where Luther stated among other things: "I cannot and I will not recant anything!" On the basis of the Papal ban and hand in hand with the excommunication the Diet of Worms, declared Luther a â€œconvicted heretic.â€� While the sentence was being passed, Elector Frederick the Wise arranged for Luther to be â€œkidnappedâ€� on his return trip back to Wittenberg and placed at Wartburg Castle for his own protection. Here he lived and worked incognito as "Junker JÃ¶rg", where he translated the New Testament from Greek to German in his Luther Stube (Luther Room). With this translation of the Bible, Martin Luther made a significant contribution to the development of a unified German language. In March 1522 Martin Luther returned with the German Bible manuscript to Wittenberg, where he proof read with Philipp Melanchthon and in September the first version went to print. His life as a monk finished in October 1524 and he later married Katharina von Bora in June. 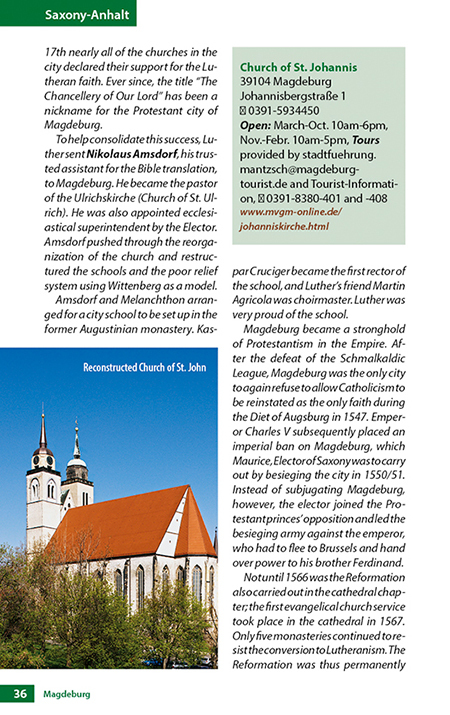 During this period the Reformation spread rapidly by the defection of several rulers to the Lutheran faith. However, there were differences between the representatives of the Reformed Church in the various regions, particularly with regard to the interpretation of the Holy Communion. An agreement was reached only in 1535 under the leadership of Martin Luther in Wittenberg on a compromise. Some health issues began to plague this powerful son of God from Wittenberg with increasing age. Especially heart and kidney disease weakened Martin Luther, who still followed a call by the Counts of Mansfeld in January 1546 to Eisleben, to settle their inheritance disputes. On February 14 in the St. Andrew's Church he started what was to become his last sermon, which he could not finish due to weakness. 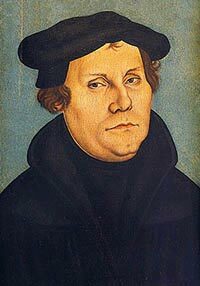 The reformer Martin Luther died on the 18 February 1546 between 2.00am â€“ 3.00am at the age of 62. Tour 1 "From Lutherhof to the market square" - takes you to the former residential houses of Luther and Melanchthon, and to the treasures in the Town and Parish Church. 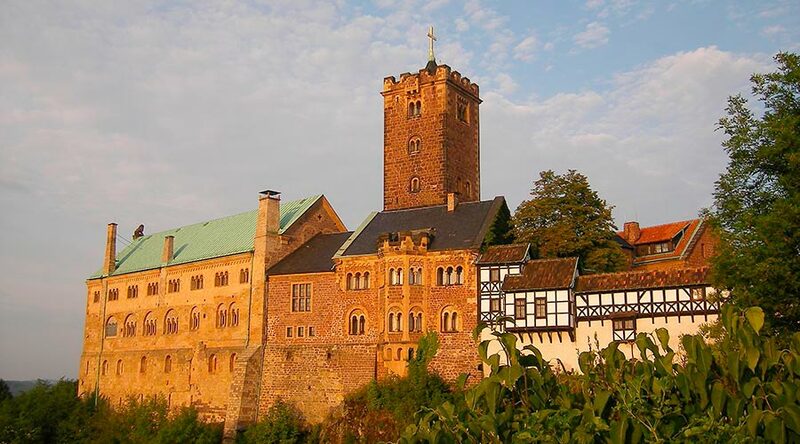 Tour 2 "The Castle and Armory" - visit the Castle Church, home to Luther's tomb and the door of the 95 Theses, and witness exciting historic remains in Arsenalplatz. Excursions. 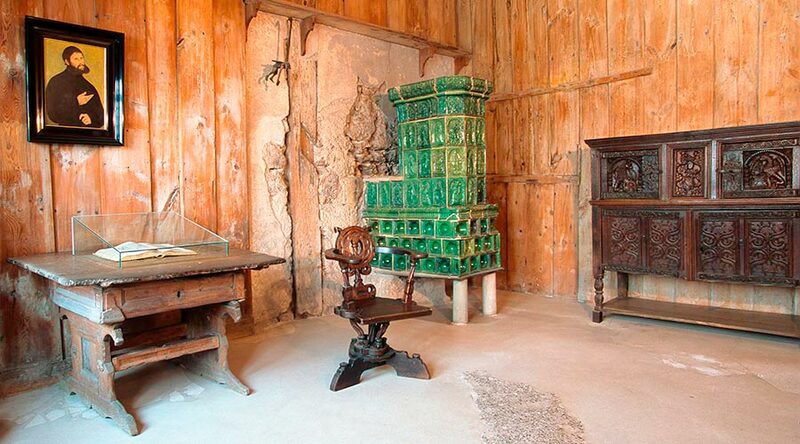 Discover Hundertwasser House, the romantic Dessau-Wörlitz Garden Kingdom as well as the Baroque town of Oranienbaum with castle and pagoda. History. From Albert the Bear, Martin Luther, Philipp Melanchthon and Lukas Cranach to the bastion of the Reformation. 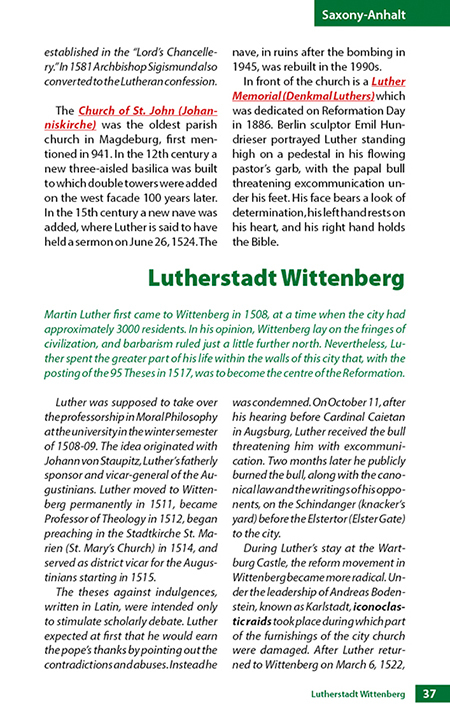 Wittenberg made world history. 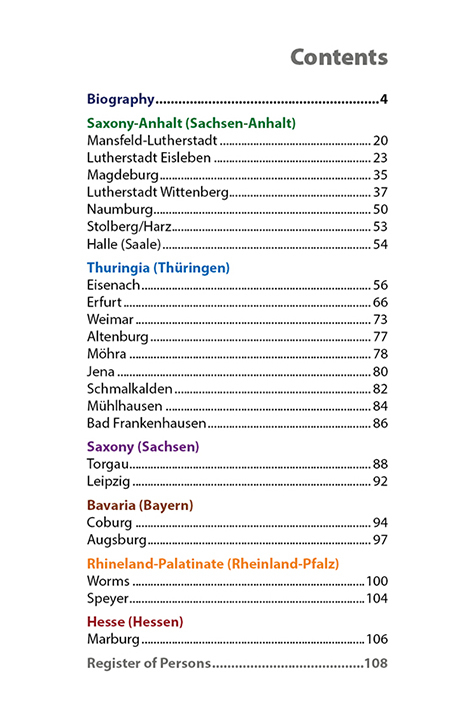 Copyright: Schmidt-Buch-Verlag 2015. All rights reserved.